Nick Clegg and Nigel Farage both called for the discussion to be grounded in facts. But both made claims that didn't stack up. UKIP's Nigel Farage and Lib Dem leader Nick Clegg went head-to-head on Wednesday night when they debated Britain's membership of the European Union. Both politicians bombarded the audience with facts and figures, making it hard to work out who was telling the truth. So BuzzFeed asked the independent fact-checking organisation Full Fact to analyse some of the key assertions made by the two politicians during their debate. 1. Nick Clegg said 7% of UK law comes from Brussels; Nigel Farage said it is 70%. Nigel Farage's 70% seems to be based upon something said by one EU Commissioner, which turned out to be a misunderstanding. 2. Nigel Farage said the EU has a "£55 million membership fee". This is only correct if you look at the costs, and not the benefits. £55 million per day is the amount given to EU institutions, but after we deduct the money we get back it's closer to £33m per day. 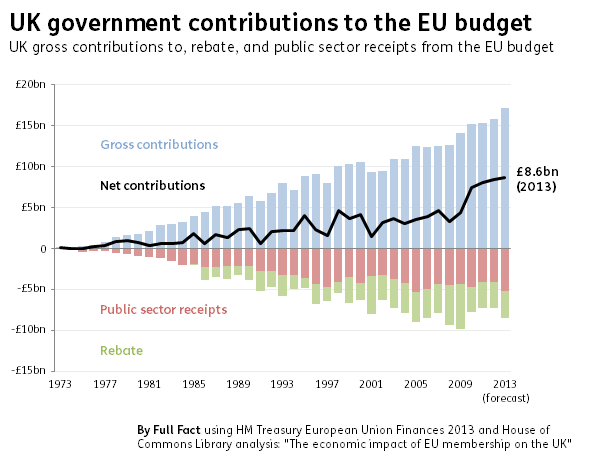 That's if we look at contributions from both government and businesses; if we look only at government contributions, the net contribution falls again to £24 million per day (£8.6 billion per year). 3. Nick Clegg said the EU is the largest economy in the world. He's correct: If you treat the 27 nations that were members of the EU when the latest statistics were put together as a single 'economy' it just pips the United States to the title. 4. Nigel Farage said last year's big increase in net migration "came almost solely from the EU". He's correct: Non-EU net migration fell from 157,000 to 141,000 between 2012 and 2013, but net migration from the EU rose from 65,000 to 131,000. About 40% of those who settle on these shores are currently EU nationals. 5. Nick Clegg said "50% of the things we produce go to Europe". He's correct, although the proportion has declined in recent years. These figures are contentious however, with some claiming that they are distorted by the fact some of our exports to the EU actually end up being bought by consumers in other countries (something known as the 'Rotterdam Effect'). 6. Nigel Farage said UK trade is managed by an "unelected Dutch bureaucrat". The European Commissioner responsible for trade is Karel De Gucht, although he is Belgian rather than Dutch. While not directly elected by the public, it’s not strictly true to say that no-one votes on the appointment of an European Commissioner. While the public doesn't get a vote, ministers from each country and MEPs do. Nigel Farage himself actually voted against the appointment of the Commission in 2010. New appointments to the Commission will be made in October. 7. Nick Clegg said there are more bureaucrats in Derbyshire than in Brussels. There were 36,519 public sector employees in Derbyshire County Council in the third quarter of last year. This compares to the 33,000 employed by the European Commission. However there are a couple of caveats: The European Commission is only one part of the EU, and not everyone employed by the Commission or Derbyshire County Council will necessarily be 'bureaucrats'. 8. Nick Clegg said 3 to 4 million jobs are linked to the EU. The 3 million figure has been described by the author behind the research it's based on as "past its sell-by date". The 4 million is an update to it. The figures estimate the number of jobs linked both directly and indirectly to our trade with the EU. This doesn't mean that this number of jobs would be lost if Britain left the EU. The studies behind Mr Clegg's figures have all pointed out that we don't know how many – if any – jobs would be lost. 9. Nigel Farage said the majority of UK voters don't want a political union with Europe. While the 'Out' campaign has enjoyed leads of more than 20 points in polls in recent years, more up-to-date figures suggest the race is much tighter. Ipsos MORI's most recent poll gave the 'Out' campaign a slight lead, while YouGov gave an equally slight lead to the 'In' camp.